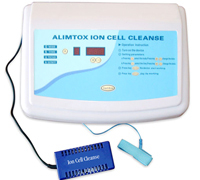 The Alimtox Ion Detoxifying Unit is quickly becoming one of the most popular Ion Detoxifying Units in today’s market due to it’s the latest technology, ease of use, effectiveness, and reliability. This foot bath relaxes, cleanses, balances and enhances the bio-energy of the body. Chinese medicine refers to this energy as “Qi”(pronounced chee). We believe, due to the effects of the Ion generator, that complex energy fields can permeate and realign the body’s energy field, while improving oxygen levels. The foot bath is widely used to increase both physical and mental energy, vitality, and stamina. At the same time, it may also purge the body of toxins, chemicals, radiation, pollution, synthetics, and other foreign material clogging up the skin – an essential part of the body’s system of elimination. The internal cleansing promoted by an ionic foot bath also can include parasite cleansing and liver and kidney detoxification. An Alimtox Ion Cell-Cleanse Foot Bath is a high tech detoxification system that can help enable the body to heal itself. It’s the perfect solution for body pollution! Add an Alimtox session after your colonic for best results!